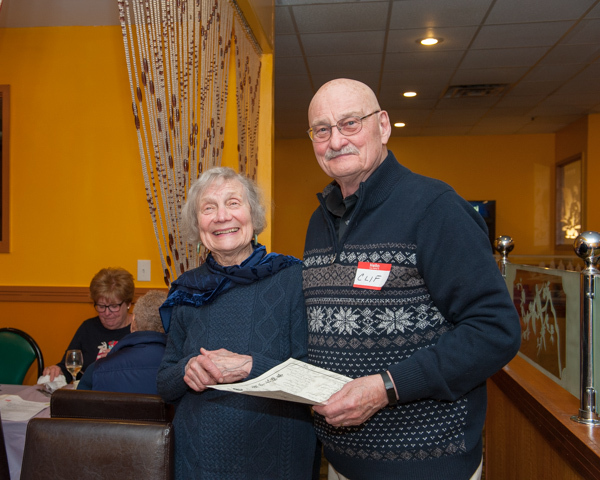 The banquet at Dynasty Buffet in Falmouth was attended by 38 members and their spouses. 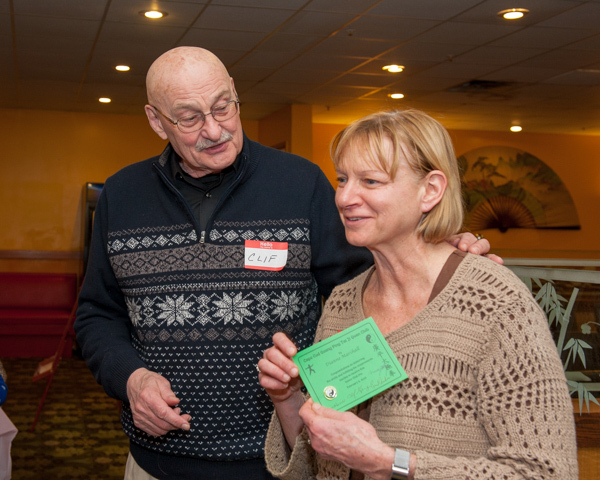 Recognition was given to white pin recipients Olivann Hobbie and Evelyn Land for learning the entire 64 move set. And Dianne Marshall, the green pin as she applies the 19 Principles to her TaiJi practice. 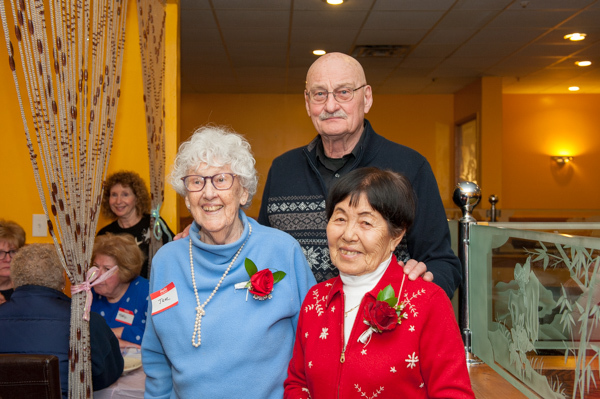 Our Octogenarians and Nonagenarians birthdays were celebrated during our dinner. Our Club's members practice Taiji into their 80's and 90's. 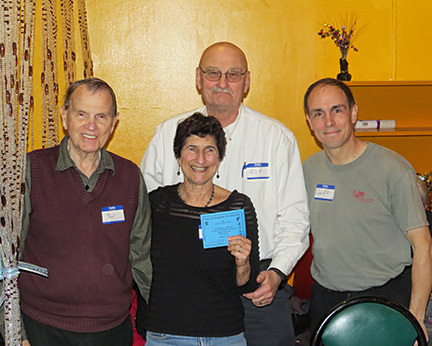 The teachers were recognized also for their work for the club: Paul Andrews, Geoff Way, Jen Kano and Clif Genge. The National Association is our sister organization. Their annual membership is due now, so if you were a member last year, then it is time to renew. 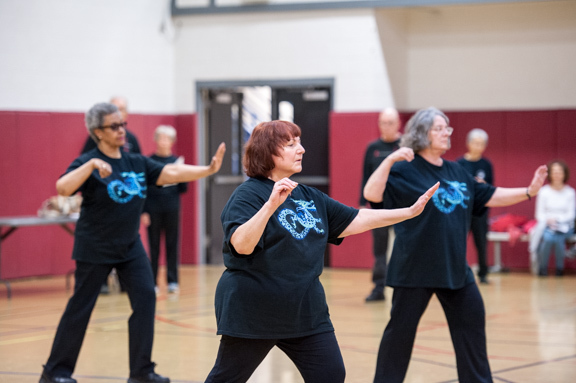 Their goal is to promote, perpetuate, develop interest in, and preserve the quality of Guang Ping Yang style T'ai Chi Chuan through-out the world, and to provide support for research and education in Guang Ping Yang T'ai Chi. Click this link to join @ $30 for new member, or $40 for renewing member. Your annual dues gives you a member discount to the national convention in October and their newsletter, The Universal Post. 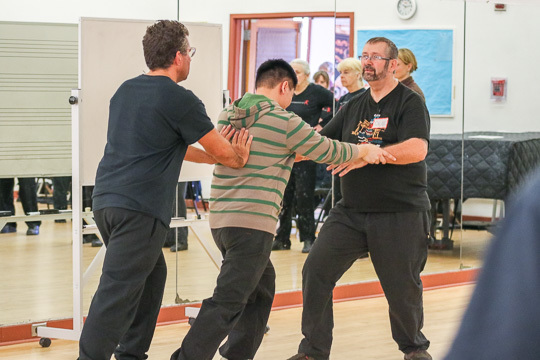 Please consider becoming a member of Guang Ping Yang T'ai Chi Association. 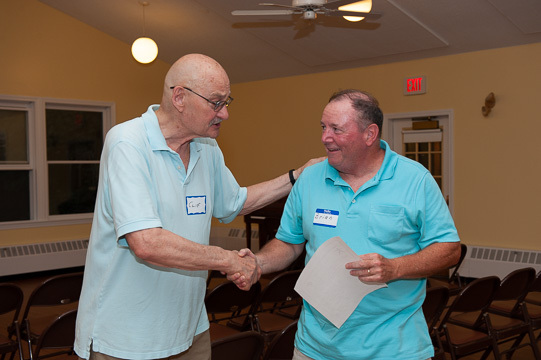 Note that the Cape Cod Guang Ping Tai Ji Quan Club promotes this organization as a service announcement for our own members. The Guang Ping Yang Tai Ji Association held their annual conference at the Resort and Conference Center at Hyannis, on October 20-22, 2017. 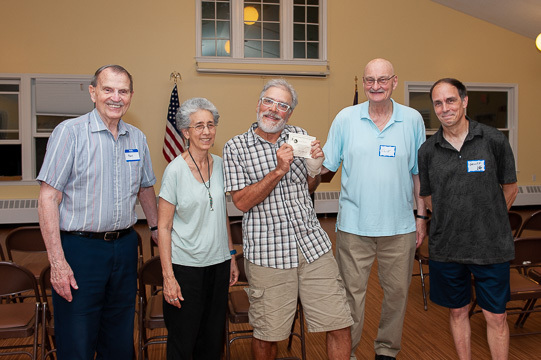 This years presenters were Dr. Erlene Chiang, FuTung Cheng, Randy Elia, Tom Carney, Dug Corpolongo, Diane Rabinowitz, Valarie Prince Gable, Michael Rabinowitz. With Special Advanced Student Workshops presented by FuTung Cheng and Tea Ceremony by Michael Rabinowitz. The Taiji For Balance Certification Progam was presented by Lucy Bartimole on October 19-20. So it’s been a few weeks since the conference, and I’m sitting here on Cape Cod sipping a cup of oolong tea and reading Randy Elia‘s book “Ancient Health Teachings of the East”. I’m grateful that Clif Genge asked the Association to hold it’s annual conference in Hyannis this year. He then got to work convincing the Cape Cod club to take part in this weekend of study. I must confess that it was a bit ‘scary’ as I contemplated signing up, not knowing if my skills would be sufficient for a National organization. 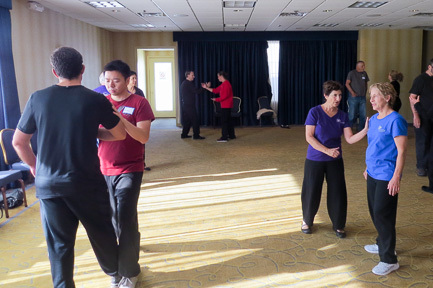 As a newbie of the tai ji practice, it was a whirlwind three days of learning new skills, studying with the Masters and getting excited about my new abilities. There was no one class that I can say was better than another! Each Shifu was generous with their time explaining how to execute a move, correct my form (eyes up, look far was a recurring phrase) and give advice in how to get the most of my practice. 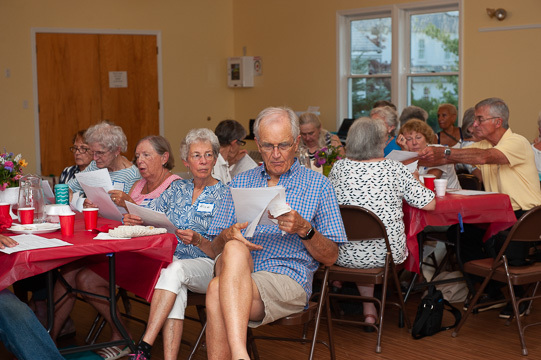 Then in the mist of all this new information, our club’s members enjoyed a wonderful bonus, the opportunity to get to know each other over the course of a day or two spent in class, lunch and dinner. All that I learned at the conference has sparked a new commitment to get the most out of doing the set. Thank you, to all those responsible for planning and running the conference. It was a fun, fast paced weekend. I look forward to next year! 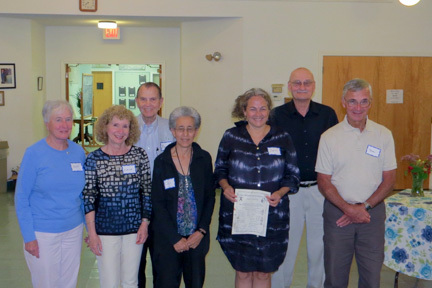 Di M.
Our annual meeting was held at the First Congregational Church's hall. Dinner was a buffet provided by Gourmet Gardens, Falmouth, MA. Tonight we honored 5 members with their white pin, a symbol of learning the 64 moves of the Guang Ping style. 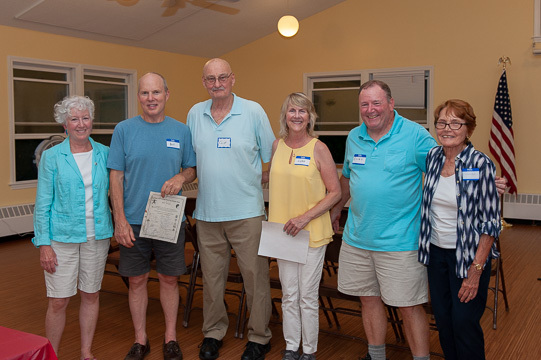 Paul Andrews, Clif Genge, and Jen Kano presented the white pins to Elin Kinney, Elaine Powers, Joe Vitullo and Judith Rahilly. One of the finishers, Jane Boulton, was not there; her pin was presented to her at a regular practice session. 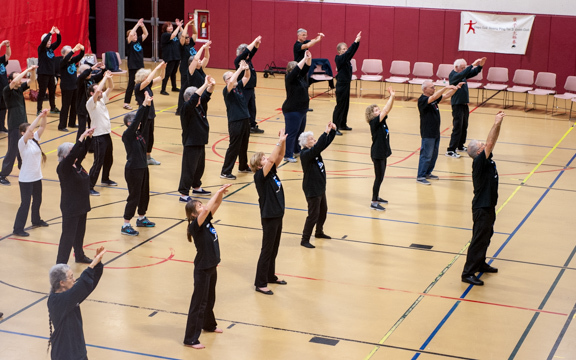 The Cape Cod Guang Ping Tai Ji Quan Club celebrated World Tai Chi and Qi Gong Day on Saturday, April 29, 2017 at the Gus Canty Community Center Gymnasium in Falmouth, MA with a Tai Chi demonstration at 10:00 AM. 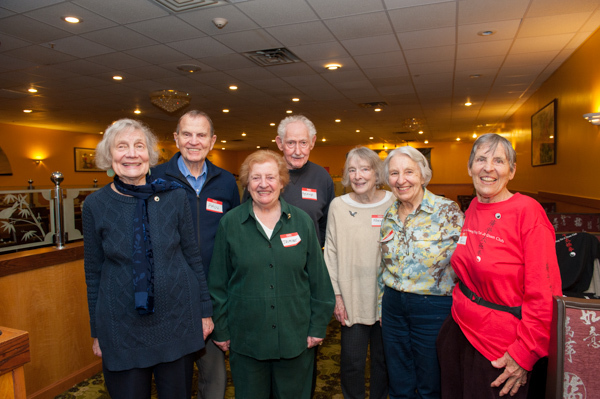 Other Tai Ji Groups, the Yulong School and the Cape Cod Tai Chi Seniors in Motion joined us in the celebration. The day begins in New Zealand at 10:00 AM and Tai Chi followers around the world will demonstrate movements integral to the discipline. The demonstrations continue around the globe in each time zone at 10:00 AM until completed in Hawaii. It is celebrated in 80 nations worldwide on six continents the last Saturday of April each year. 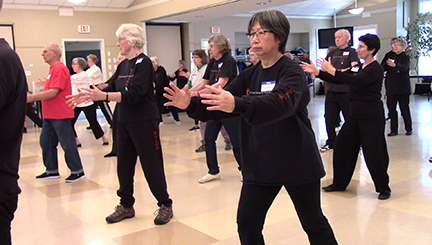 Since 2005 the Cape Cod Guang Ping Tai Ji Quan Club has participated in the wave of calm and healing that spreads around the globe every year on the last Saturday in April. 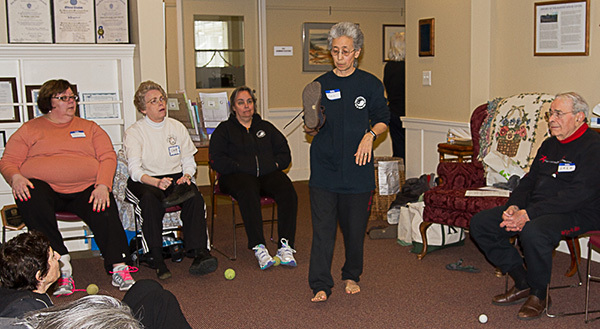 Al Moniz leading the members and guest in a Qi Gong set. 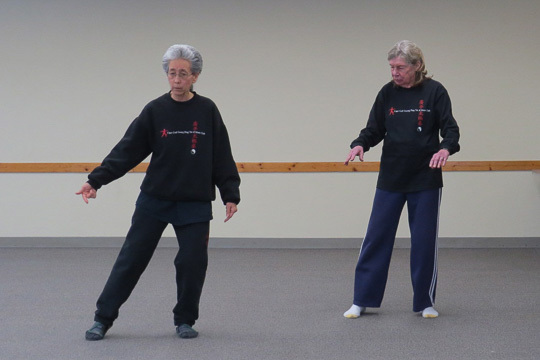 The Cape Cod Tai Chi Seniors in Motion performed an 8 move set. 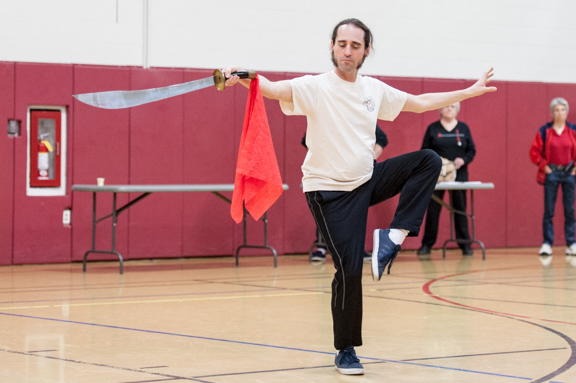 David Chosid, from the Yulong School, performing the Yang Dao Broadsword Form. 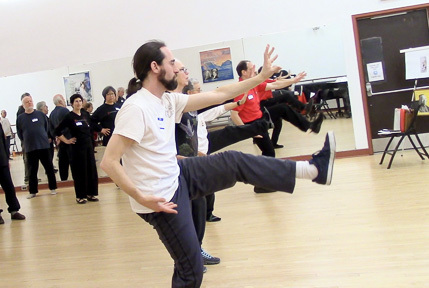 Alex Kreider, from the Yulong School performing Yang Style Tai Chi Short Form. 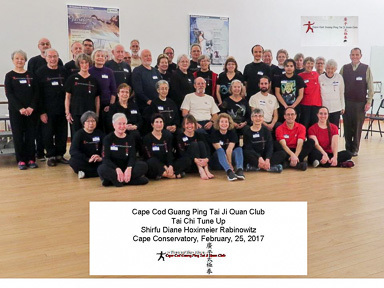 The Cape Cod Guang Ping Tai Ji Quan Club held its fifth spring training day March 25, 2017 at the Mashpee, MA Senior Center. 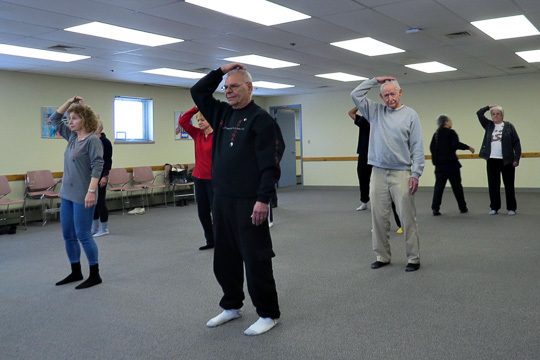 This year we renamed it “Tai Ji Immersion Day” and it was shared by a combined group of thirty four members of the Cape Cod Club and six members of the Yulong Tai Chi Chuan School. After the warm-ups and set a group Silk Reeling session was lead by David Chosid and Clif Genge. This was followed by break out sessions lead by Paul Andrews, Jen Kano, Al Monise, Louise Sebra, Dave and Clif. Participants had their choice of Tai Ji Basics Loving Care for Your Foundation (covering the importance of the feet and how to care for them) and Yin and Yang and Tai Ji Philosophy in the first hour and Tai Ji Principles in Daily Living and an Applications Workshop in the second hour. 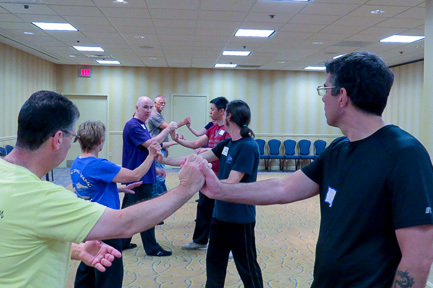 Attendees found the sessions filled with useful information and several members were sharing their plans for incorporating many of the ideas into their Tai Ji practice and daily living. On February 25, 2017 Mother Nature blessed us with a respite from our freezing winter to a 600 sunny day. A beautiful Cape Cod day! 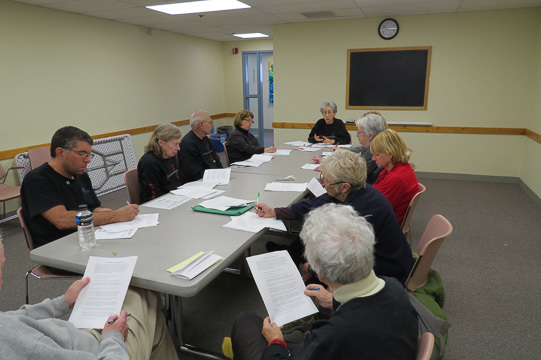 The members of the Cape Cod Guang Ping Tai Ji Quan Club had to decide if we were going to hold our Tai Chi Tune Up inside or outside the Cape Cod Conservatory. 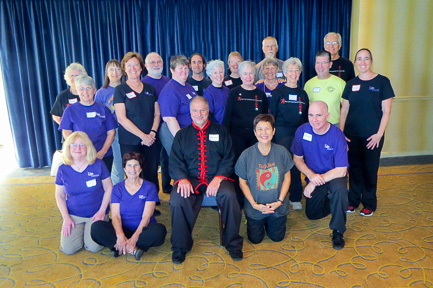 We elected for inside and had an absolutely marvelous day of sharing Tai Chi as the quality of the instruction was even better than the day. Shifu Diane Hoximeier Rabinowitz delighted everyone in attendance as she shared her knowledge and expertise in our Guang Ping form. 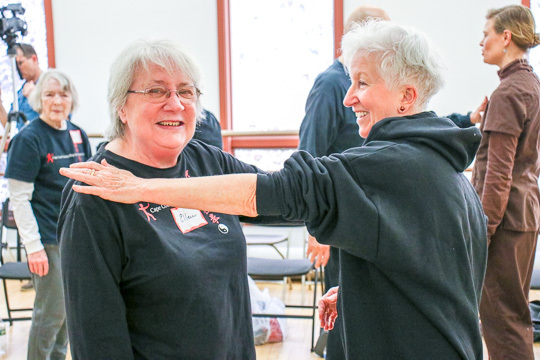 It was a reunion for several of the people in the club as they started studying tai chi with Diane in the late 1980s. Between the many hugs and smiles they swapped remembrances and stories of the all the times spent together. After a little time for the Club nostalgia Diane told us about her beloved Shifu, Grand Master Yun Chung Chiang and some of his many talents as an artist, calligrapher and martial arts master. He would have been pleased to see that his trips from California over 20 years ago helped start a tai chi organization that is still active and thriving today. She then got right down to the instruction and worked us through the warm-ups and kicks and into the intricacies of several moves. We all had a better understanding of the benefits of the guang ping form as we performed some of the movements and she reviewed the basic principles, uses and benefits. At times it was hard work but well worth the effort. 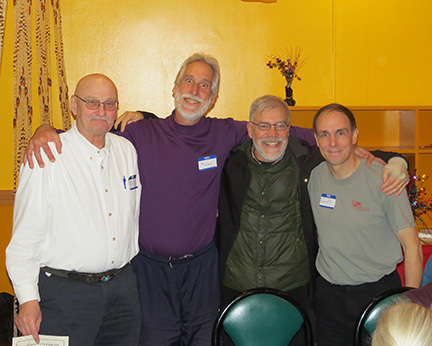 We were fortunate to have David Chosid and some of the members of his Yulong Tai Chi School join us. Everyone in attendance was thrilled when David joined Diane, and two of the Club teachers Jen Kano and Geoff Way executing the walking and marching kicks. And, when David and Geoff performed the walking slap kick and double jump kick we were all in awe. At the end of the day everyone agreed that we shared a wonderful of day of friendship and learning tai chi. We are grateful to Diane for introducing Guang Ping Yang Tai Ji to Cape Cod and to Y. C Chiang for sharing all his knowledge, skills, caring and kindness with those who continue to pass his gifts on to us. 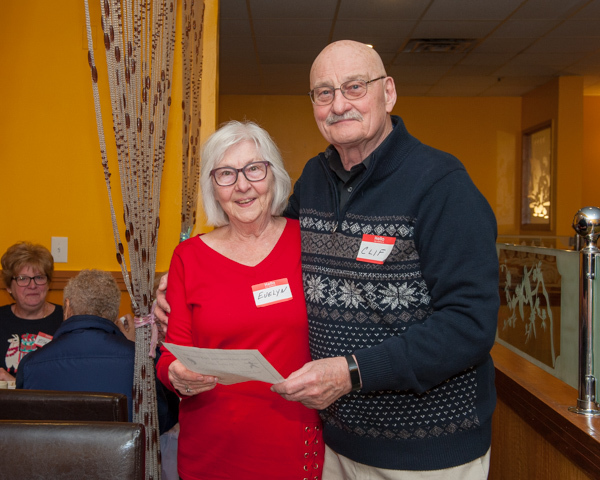 The banquet at Dynasty Buffet in Falmouth was attended by 25 members and their spouses. Recognition was given to pin recipients Michael Dvorak, white pin, and Suzy Burnette, a blue pin. 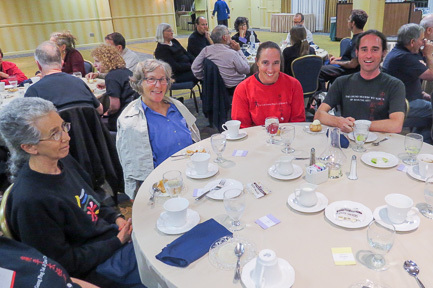 The teachers were recognized also for their work for the club: Paul, Geoff Way, Louise Debra, Allan Moniz, Jen Kano and Clif Genge. 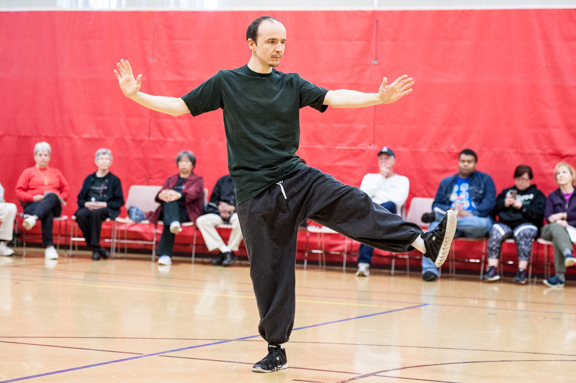 FuTung Cheng taught a Master Class "Effortless Flow"
FuTung Cheng instructing at October 2015 workshop.